This eleventh participation in the Running of the Bulls made by the Fuente Ymbro bull-ranch proved to be fast and clean. As the pack moved up the Santo Domingo slope, one of the bulls charged to the front alongside two of the steers. Soon there were two small groups formed, even in this first stretch of the run. Having reached Estafeta, this same bull who had lead the pack from the beginning of Santo Domingo, slipped up and brought down a runner at the same time. Several of the Fuente Ymbro bulls and the steers coming behind also knocked and bruised this same runner as he lay on the ground. This fourth Running of the Bulls of 2015 was covered in 2min. 24sec. As the bulls loosened up even more on the final stretch of Estafeta, and at Telefónica, it meant that there was space for the runners to get close to the horns and there was some exciting and spectacular running to be seen here. The 5th time that the running of the bulls has no injuries. The previous was on 07/10/1988. In 11 participations this is the 1st time that the Fuente Ymbro have not caused injuries from bruising. Among the 11 running of the bulls of Fuente Ymbro in Sanfermin this has been the 2nd shortest (2'24''). The fastest was on 07/13/2009 (2'23''). 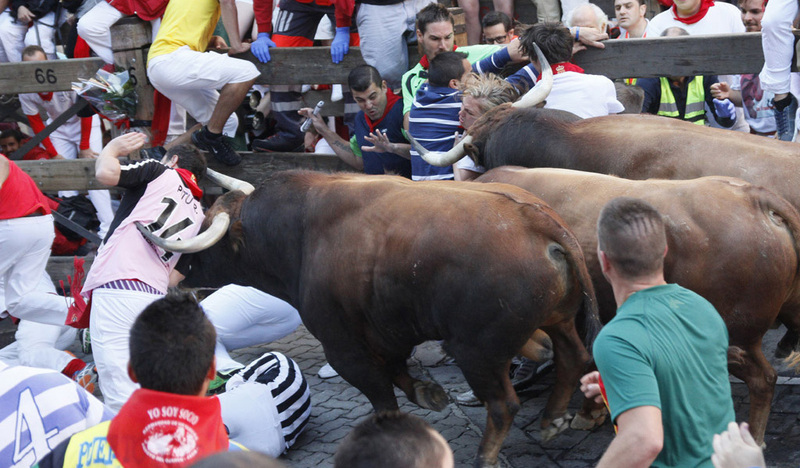 The 2nd time that there are no injuries in a running of the bulls held on Friday.